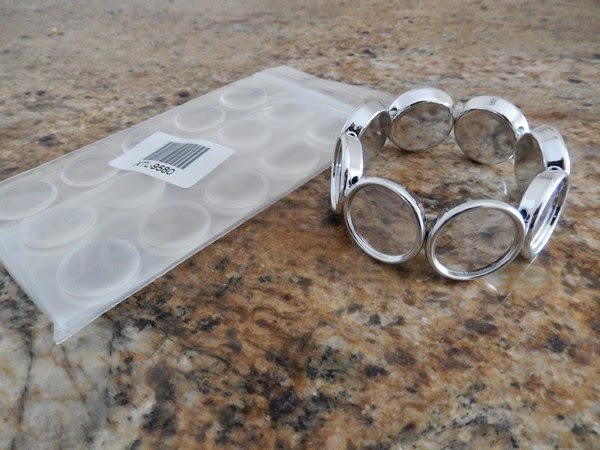 I bought a bunch of plastic stretchy bracelets and matching adhesive covers from Beadaholique because..well, they were cheap and I have a craft supply hoarding problem. I wanted to make "boyfriend" bracelets for cons - you know, with my anime bfs. lol. I started compiling a list of eligible fellas, but couldn't par it down to my top 8 (insert out-dated myspace reference here). :P I'm still working on it. The only one I'm 100% including is Trunks, my first love. Haha! 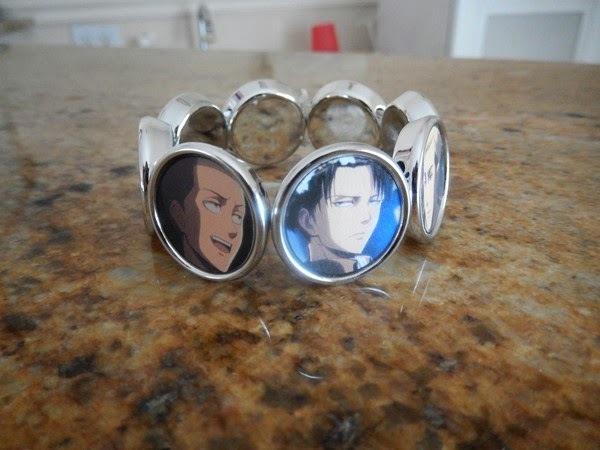 Anyway, Penga-Sis thought the idea needed to be more cohesive than just random guys, so she made an attack on titan boyfriend bracelet! 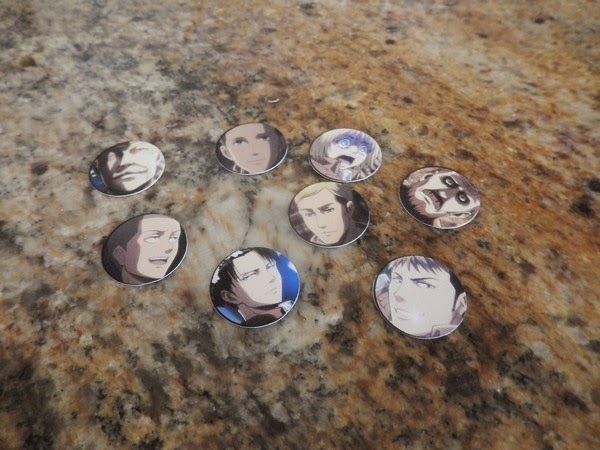 She found the pictures she wanted, printed and cut them to fit the circles.. Some of those are kinda questionable choices IMO. 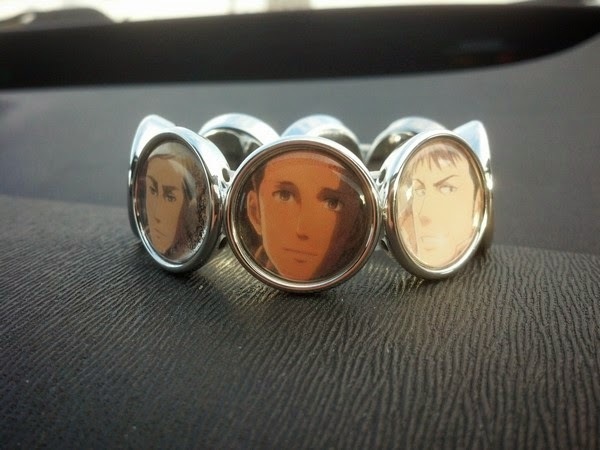 Maybe an all-Levi bracelet would've worked better. 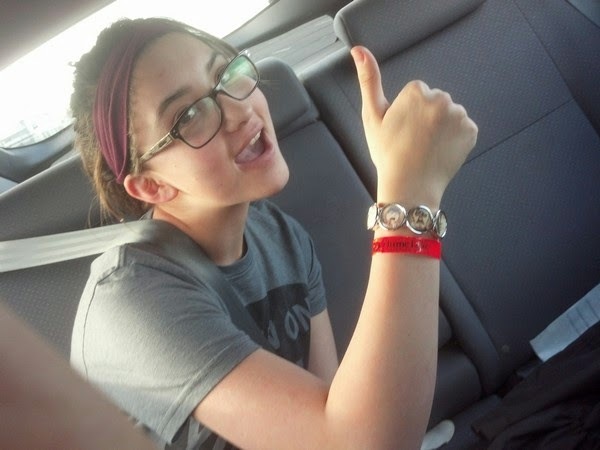 A small dab of tacky glue was used to stick each picture into the bracelet. Admittedly, I do have a soft spot for Connie. I don't think Levi agrees though. Let it dry, then just pop the adhesive backed cover sticker on top! 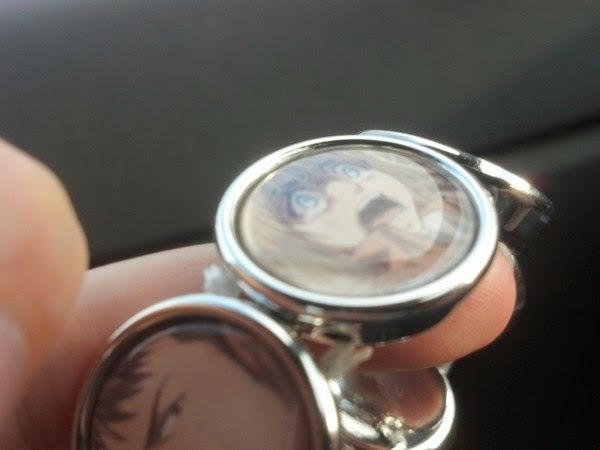 Armin has seen terrible things! I love the bevel it gives - but I don't think this is waterproof or anything. The sticker is pretty strong though, so it shouldn't fall out. Anyway, it's a fun craft I think for kids (or fangirls)! You could put any favorite pictures inside. I still need to work on mine before Fanime! 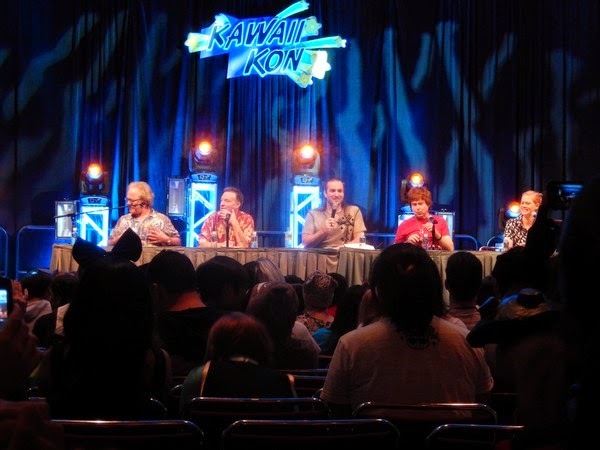 Sak and I made it to Oahu again for Hawaii's anime convention, Kawaii Kon. It happened to be their tenth anniversary, so I was pretty excited. Though that last week of work leading up to our vacation was super stressful, and I had work nightmares for a couple days into the con. Like the kind where you forgot to do something really important, screw up a presentation, or where you wake up and go to work in your dreams. I realllllly needed a vacation! The con expanded to the bottom floor this year, where the dealer's hall and artist alley were combined. I picked up a cute bento tank for my sis from a local artisan (from the same town as Sak), as well as a new wallet (leather with the survey corp symbol stamped into it!) since my cheapy daiso one was falling apart. Sak also bought me some Zelda navi earrings from Sanshee, squeee. Anyway, since it was the tenth anniversary, the guest list was extra awesome! 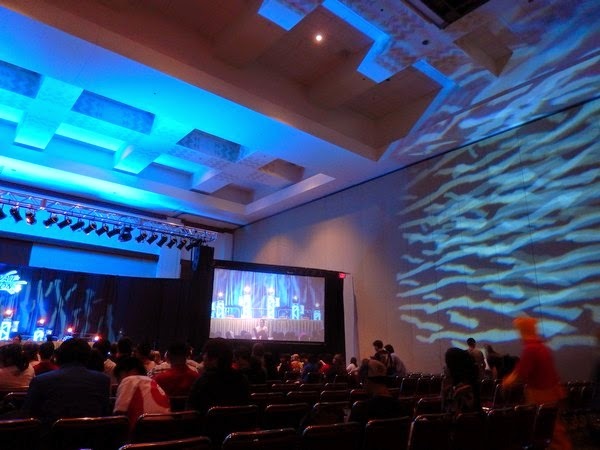 We saw Kageyama-san and Ishida-san in concert, two veteran anime theme song singers - including some Sailor Moon and of course, the crowd favorite - Cha La Head Cha La, the DBZ theme song. Everyone was singing along just to the chorus :) Sparking! Kageyama-san is pretty hip looking considering he started his career in the 70s! The main stage was beautifully lit this year too. 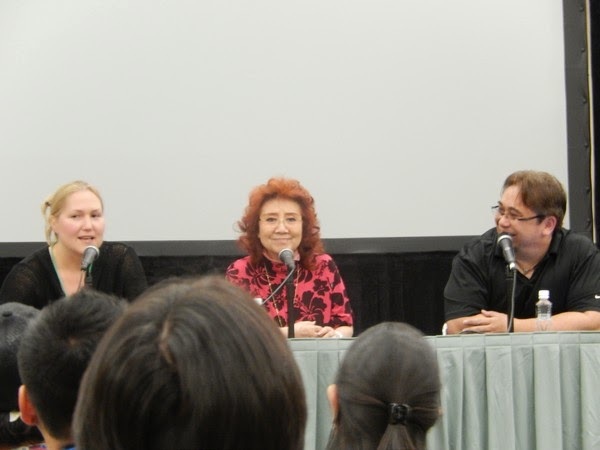 We also saw Nozawa-san, the seiyuu (voice actress) for Goku, Doraemon, Astroboy and many, many, many other voices. She was so cute! And she taught us how to do a proper kamehameha. Lol. 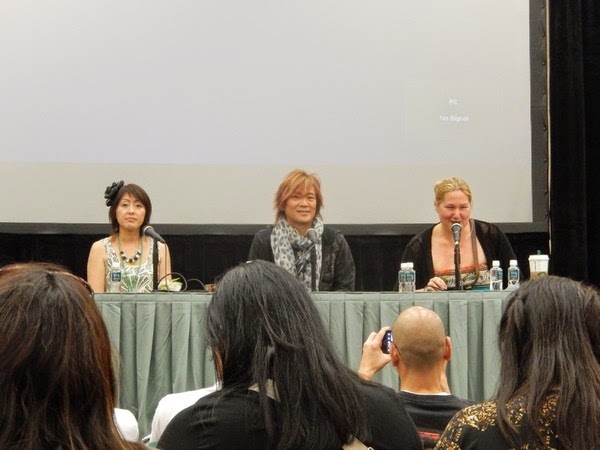 The voice actors, left to right, are famous for Pooh/Tigger/Darkwing Duck, Invader Zim/Billy/Alpha 5 from Power Rangers, middle guy is the host of the reading, Axel from Kingdom Hearts/Raiden from Metal Gear, and Korra! Moving on from guests, the rest of the standard rooms were there. I liked the stage setup they had for rock band, though I still think game rooms need to be in big, open, well-ventilated areas! (still less stinky than California cons though, lol). 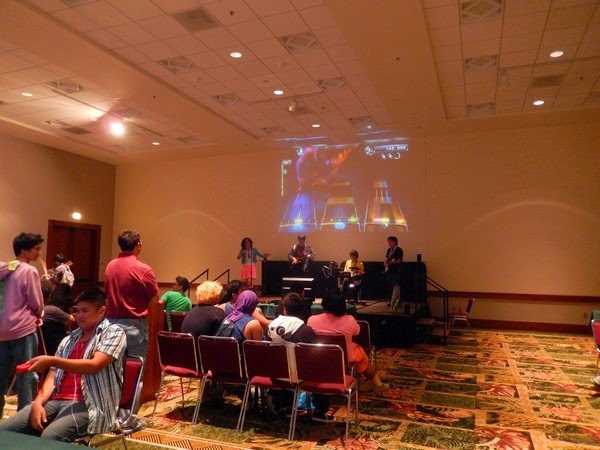 They had a Pokemon X/Y tourney too - which would've been so awesome if I wasn't such a chicken lol. 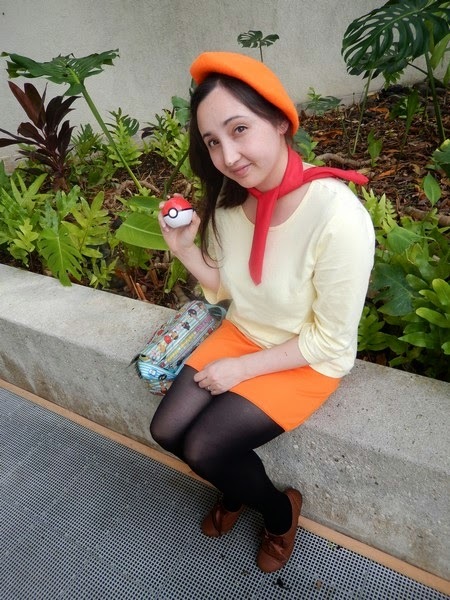 Speaking of Pokemon, our cosplay this time was the very obscure honeymoon trainers from X/Y. Very obscure as in, no one recognized us at all. Lol. I think people were like, why's this guy wearing a scarf..in Hawaii??! 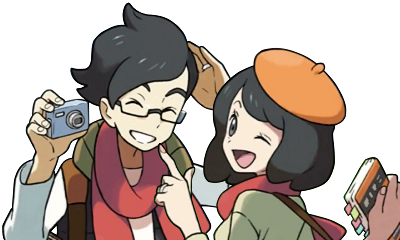 So obscure I can't even find a full body pic online. lol. Oh well. I thought it was cute, and I wanted the beret. :P I only made the scarves and the skirt for this one. 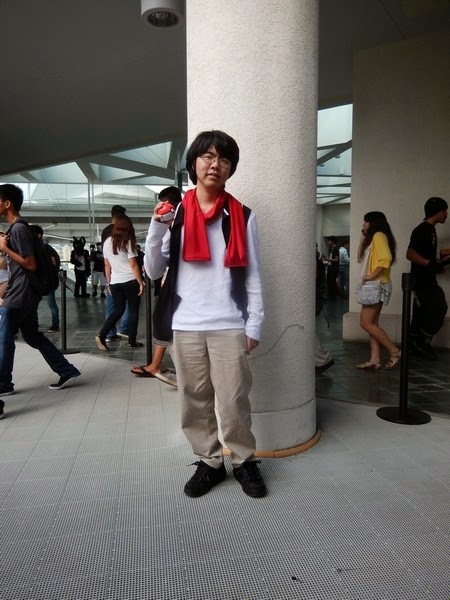 Pretty simple cosplay. 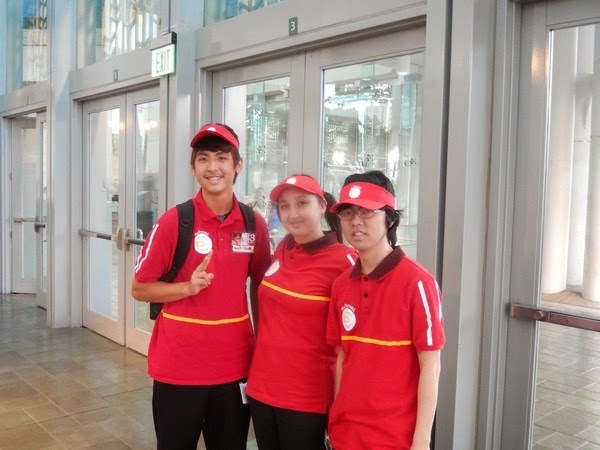 Anyway, we also re-wore our Mgronalds uniforms, and I guess Hataraku Maou-sama has been out long enough, because a lot of people recognized it! 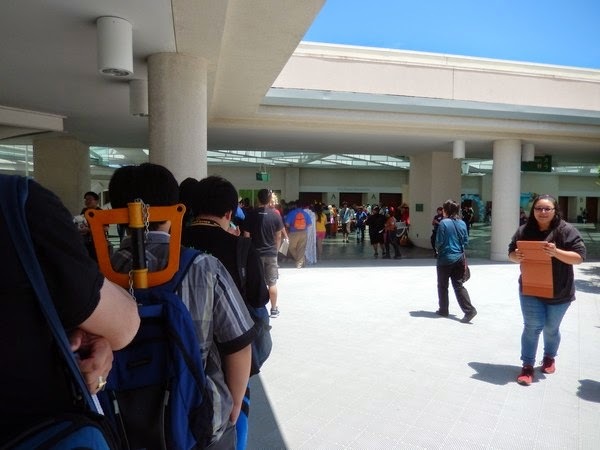 There were other people cosplaying it too! This guy found us so we took a picture together. Looks like he used the same transfer vinyl method for making his shirt/hat too! Lines were manageable despite the 9-10k+ people in attendance. AMVs were amazing, and if you haven't seen Anime 101 yet (it'll probably be making the contest circuit and sweeping up awards all year), you should! If you're a fan of school-life based anime, you'll appreciate the humor. 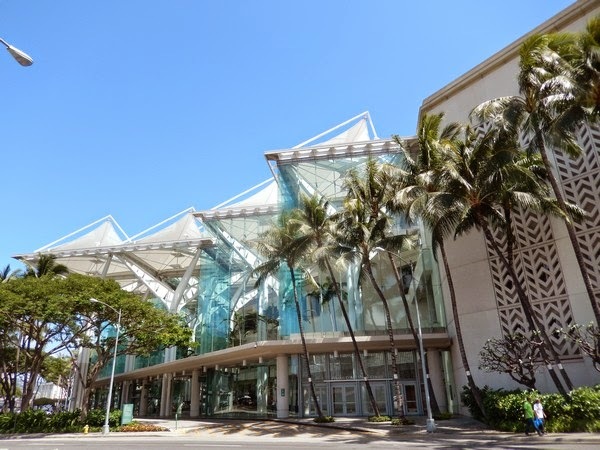 We stayed two nights at the Ala Moana hotel again, which I loooove. It's just so perfect, being attached to the mall and right across the street from con and the beach. So nice. And theres a fridge to store my poke in. Yess. How's this for mall food? 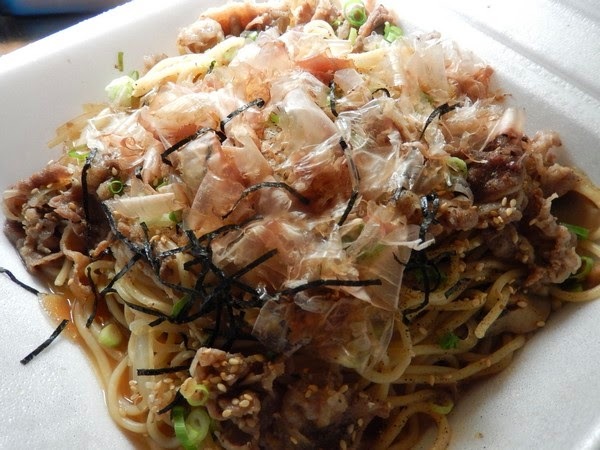 Sukiyaki noodles, delish! Anyway, two new panels we tried this year were Iron cosplay and Otaku family feud. I'm so glad we checked them out! Iron cosplay was based on Iron Chef. There were four teams and each team could use "ingredients" such as duct tape, fabric, foam, etc. to make a costume in like, 30 minutes. Though I could've used a little more audience interaction to keep us entertained during the 30 minutes, the end result was pretty cool! People were pretty creative. I liked the creeper the best, but Duct tape Captain America won! And Otaku family feud..what a great concept! The contestants could have been more diverse though. They were pretty much all hetalia/free fangirls. The host was really really good at his job, which makes or breaks these types of games. 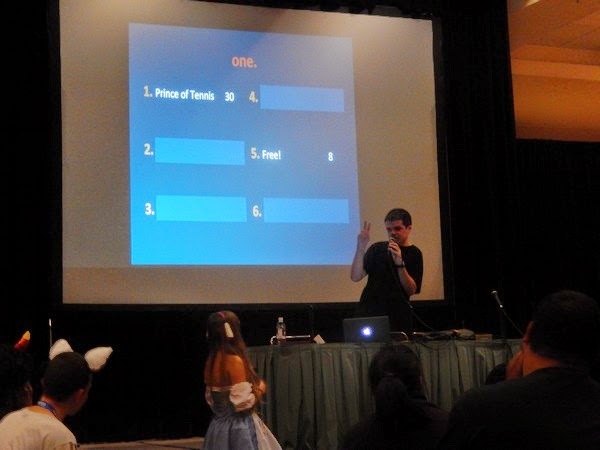 Questions was something like "Name a popular sports anime"
All in all, I really enjoyed the con this year! And it cured my work nightmares, so that was good! Haha >.>"
I like to keep this blog a happy, if not neutral place - but sometimes...I just need to type. My brother called while we were on vacation. His voice broken, a sound no one ever wants to hear. A sound that sends signals to your heart the moment you hear it, clenching your jaw and furrowing your brow for the inevitable emotional impact. We lost a dear family friend that we've known for twenty years. A family member, really. It was sudden, and unexpected, and if you could see my facebook, you'd see that my entire hometown is reeling in shock. We met Joanne because her daughter was in the same kindergarten class as my brother. She had a son a little younger, who got along well with my brother too. Years later, she and my mom both had their youngest daughters about the same time. When my sister was little she would call both my mother and Joanne "mom", since our families were so often together. Parties, church, school, shopping - and just plain old hanging out were normal. She always told it like it was, and I think that down-to-earth, genuine spirit really stood out. Even me, an arrogant young teen with a problem with female authority (yes, that in particular, so weird), would feel shame when she'd chastise me for sassing my mother. She was always the hostess - filling her garage parties with yummy food. You never left hungry. And you never left without at least one plate of leftovers. And she'd always be there with food and a helping hand at other peoples parties too. I can close my eyes and see her at birthdays, graduations, and Christmas mornings where Mom would always find her something cow themed since that was Joanne's favorite. I'll never be able to eat spinach dip, cookie cakes, or warm banana bread without thinking of her. They were simply the best. I'm thankful that she shared herself, and her big, wonderful family with us. I'm thankful for the long friendship she had with my mother especially. And I'm so amazed by the strength and reliance on God that my mom has now. Overwhelmingly (and on the MUNI bus of all places), my broken heart was filled with something other than grief and anger - it is filled with awe. Awe of the immense hope the Resurrection has given me. How glad I am that the tomb was empty! I can have faith that this life is not the end of the story. That death has already been conquered, and that Joanne is up there sharing her famous spinach dip with those that have gone before and helping prepare the great party we'll all have together someday with Jesus.